Do you have a young collector at home? My kids are both avid collectors. From rocks and minerals to cicada shells to the latest plastic fad toys, they either already have or badly want it all – sometimes to the point of complete obsession. I’ll hazard a guess that I’m not alone here and many parents can relate to this. I can even remember the collector-card crazes that were popular when I was a kid and how important getting ‘the full set’ seemed to me at the time. Needless to say we’ve been collecting the Disney Movie Stars cards from Woolworths since the promotion began earlier this year and both of my girls are getting into it with gusto. They’ve been trading their doubles with school friends and are now close to having completely filled albums – in fact miss R is just one card away from achieving that elusive ‘full set’ herself. If you’re not familiar with the Disney Movie Stars series they are cards and stickers featuring characters from Frozen, The Lion King and Mickey Mouse amongst many others and you receive one packet free with every $20 you spend at Woolworths. There is one card and one sticker in each pack. The collector albums (RRP $5 each) are filled with movie trivia, jokes and pictures and are definitely worth having so that you can keep track of your collection. You can also view some ultra-cute content on the Woolworths youtube channel showing kids talking about their favourite Disney stories and characters. One rather exciting feature of the cards is the four projectable movie scenes along the bottom. We own a mini projector (of course) and the girls love switching off the lights and projecting scenes from some of their favourite Disney movies onto their bedroom wall at night. The projector is available in store for $8. 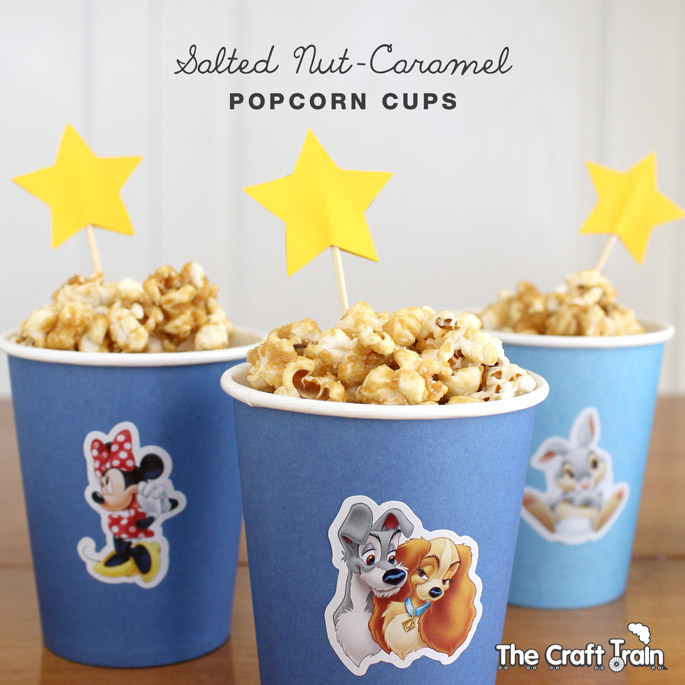 To go along with the movie theme we’ve made some tasty Salted Nut-Caramel Popcorn cups. This gluten-free, dairy-free recipe uses coconut syrup instead of refined white sugar for making the caramel, as well as a home-made nut butter instead of ordinary butter. It’s a delicious combination and way healthier than traditional caramel, but saying that coconut syrup is still a type of sugar and the oil in nuts is still a type of fat, so it’s still a treat in my book. I’d recommend to stay away from microwave popcorn and go for the less processed packet of plain corn kernels. You can pop these in an air popper if you have one but we don’t (although it’s on my list of things to buy) so we just popped the corn in a saucepan according to the packet directions. 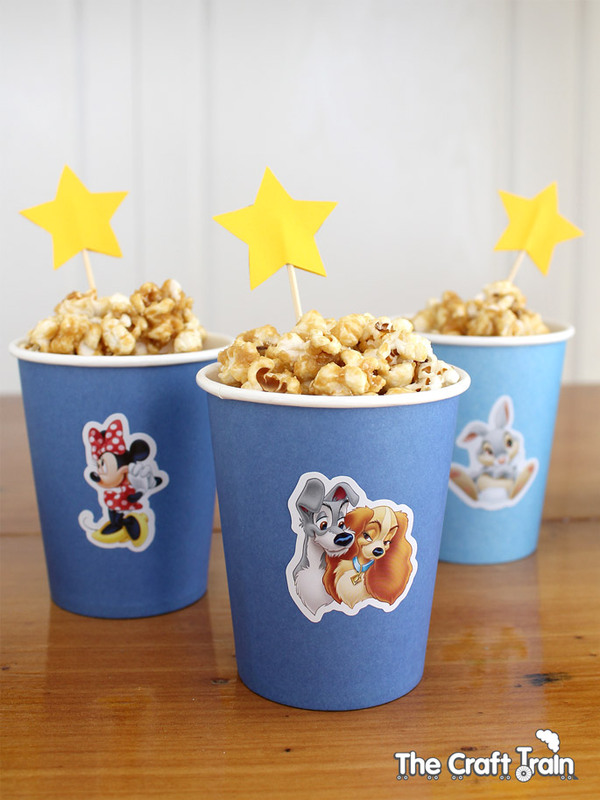 Our popcorn cups are super-simple and quick to make, and would be a fun idea for a family movie night or a kids’ slumber party. 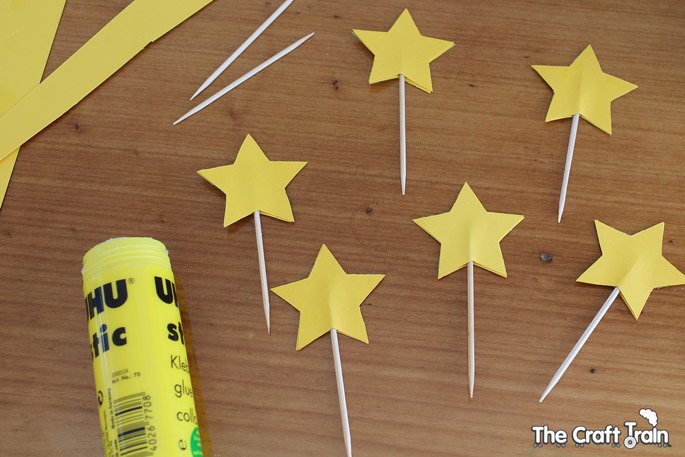 To make the star toppers fold some yellow card in half, trace a star shape onto it (a small star-shaped cookie cutter would work perfectly for this) and cut out while folded so you end up with two stars. Glue them back-to-back over a toothpick to create your topper. 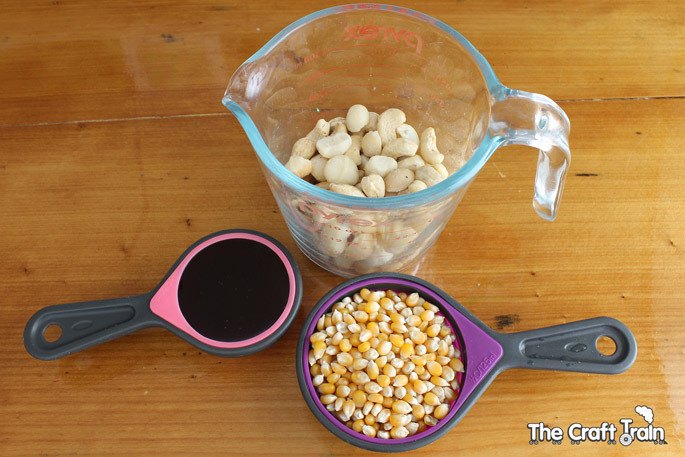 Cook 1/2 cup popcorn kernels according to the packet directions, or use an air popper if you have one. 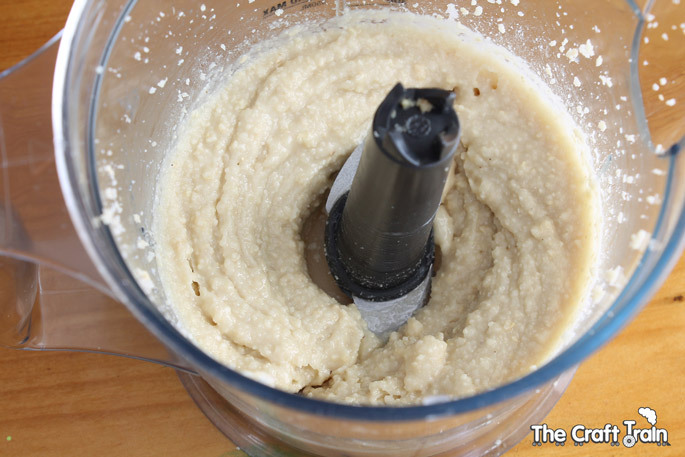 While that is cooking make the nut butter by processing all of the nuts along with 1 tsp coconut oil in a food processor until smooth. It's OK if there are still some crunchy nut pieces in there so long as it is mostly smooth. To make the caramel cook the nut butter along with the coconut syrup in a small saucepan over a low heat until it has blended well and the nut butter has melted and softened. Crack some salt into the caramel mix to your liking. 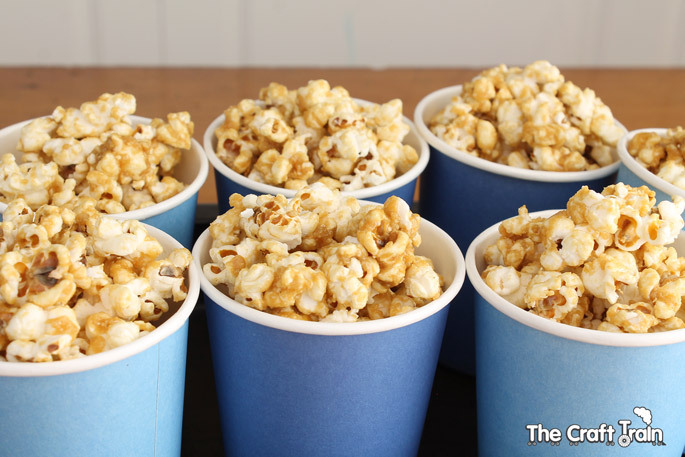 Tip the popped corn into a large bowl and pour the caramel over the top, mixing it all together with a metal spoon until all of the popcorn pieces are well coated. Scoop the mixture into paper cups and refrigerate for 30 minutes before serving. 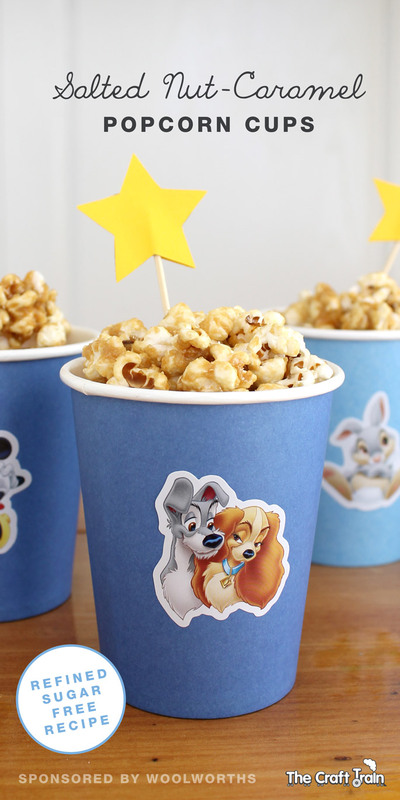 To make the popcorn cups look extra-special stick a character sticker from the Disney Movie Stars series on the front of the cup and place a star on a toothpick in the top. 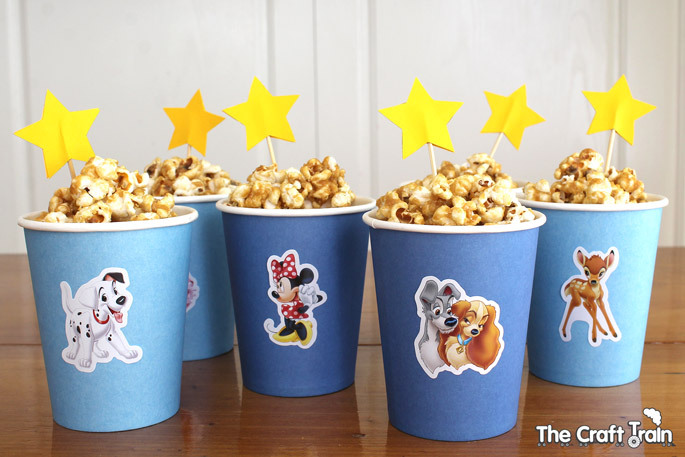 The girls loved using the stickers from their Disney Movie Stars collection to make special character cups, and we all thought the popcorn was yum! 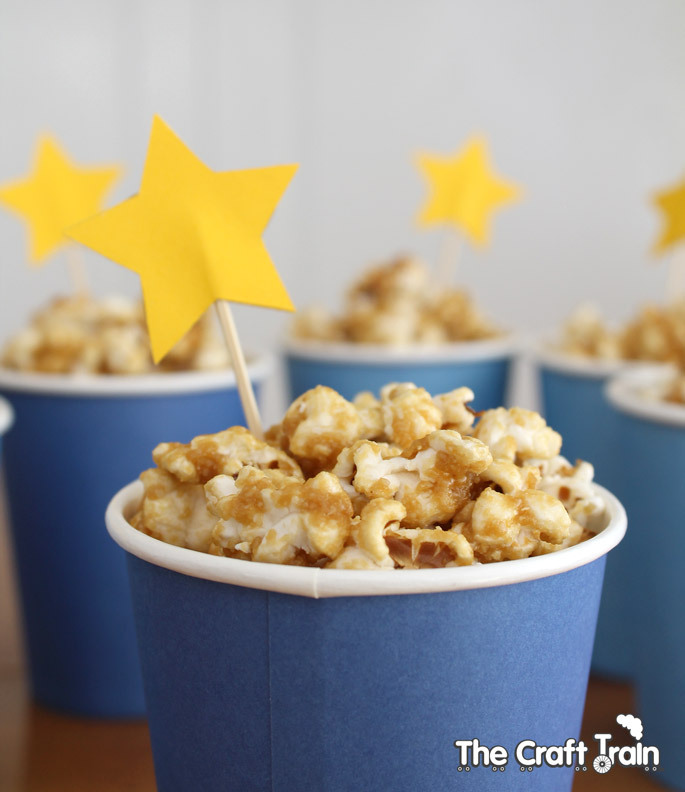 You can find lots more fun party ideas on our dedicated parties board on Pinterest. Are you following us? Oh yum! This popcorn sounds divine! I’ll definitely try it. We have a few of those Disney cards too. 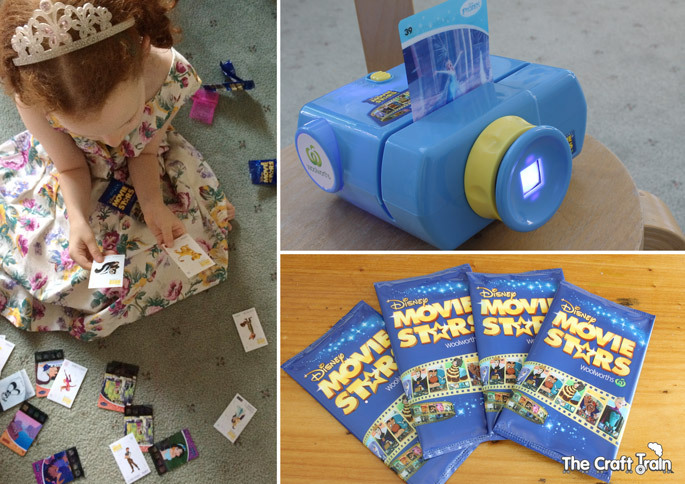 I hadn’t seen the mini projectors before either – that’s kinda cool! Thanks Danya – the projector is pretty cool! I have a really serious collector in my house and she just loves those Woolworth cards. 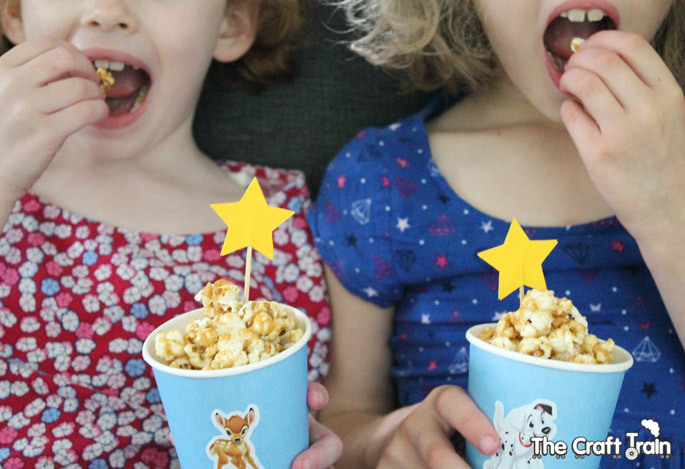 This popcorn recipe would suit the tastebuds of our whole family too! Thank you. Oh yum! that sounds so good! We will be trying this out!! My kids loved the wildlife cards too!